I am so, so, SO excited to announce that my wonderful friends Sabrina (@booksandcloudydays), Casey (@caseyrosereads) and myself have teamed up to bring you another super fun photo challenge for October! We wanted to go with a spooky, scary vibe, and all of the posts are detailed below for you if you have any questions! If you need further explanation, do not hesitate to contact any of us for help, we would be happy to answer any questions at all! I am so looking forward to this and would be so delighted if you all joined us! 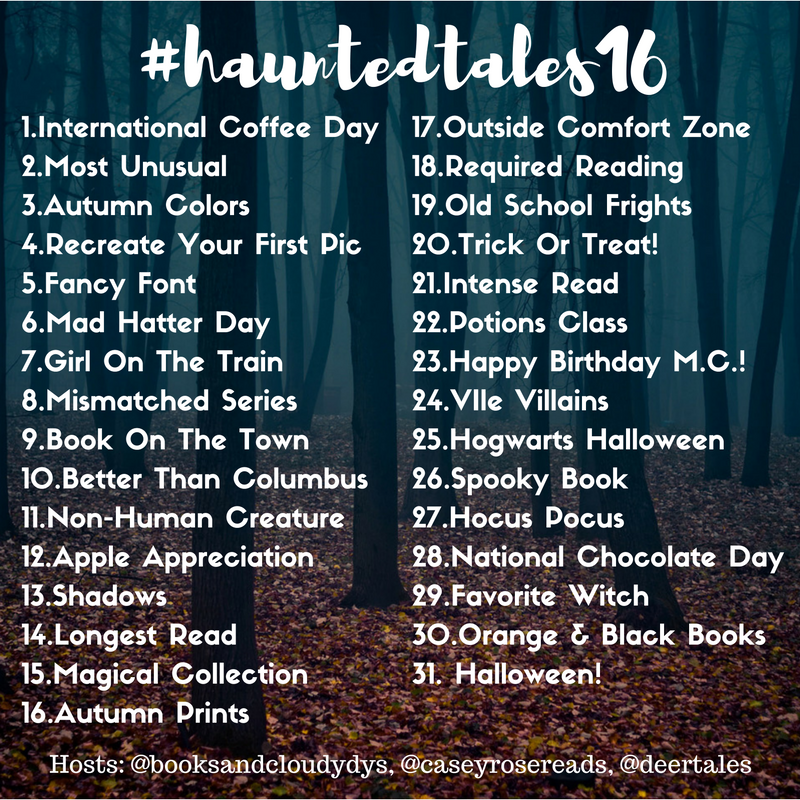 Don’t forget to use the hashtag #hauntedtales16 so we can see all your amazing spookiness!!! Celebrate coffee from around the world, or show off something special from your area! Not a coffee drinker, how about some International Tea? What’s the most unusual book you own? Show off those red, orange, yellow and gold books. Looking back at first bookstagram pics can be a little scary, how about a do-over? Feature your favorite book fonts, whether they’re on the cover or inside the actual book. Victorian ghosts love this kind of thing. Have a mad tea party and show off those Lewis Carroll books! Loved the book? Celebrate the movie premier with a sinister book pic! Hated the book? Show us which book you would rather be made into a film. What’s scarier than that bump in the night? Owning books in a series that don’t match! We’re serious when we talk about loving to get to know our fellow bookstagrammers. Take a book out on the town and show us a little bit of your hometown. Many cities have already done away with the garbage holiday that is Columbus Day. We’d like to jump on board: What author or book character should have their own national holiday? House elves? Centaurs? A Faun found near a snowy lamppost? Show us your favorite non-human creature. Pumpkins shouldn’t get all the attention, apples are awesome too! Incorporate *gasp* shadows into your pic today. You know what’s terrifying? Facing a 1400 page read, that’s what. Show us your most magical books. Colder weather calls for tartan scarves and plaid flannels. Show off your book with some cozy fabric. It can be scary to step outside of your comfort zone but try something new. Whether it’s a genre you don’t normally read, or a new way to set up your photos. Maybe this is a book you had to read for school, or maybe it’s the book you push on everyone you know! Dust off those Goosebumps books, or those Christopher Pike tales. Don’t own one anymore? Let this be an excuse to pick up an old favorite. October 20th: Trick or Treat! Raise your hand if you start buying Halloween candy early! Time for some book and candy pics. Ever read a book that makes you literally jump, or glance around the room in concern? We’re dying to see that book. Maybe you’re channeling Snape today, or the witches from Macbeth? Or maybe you’re brewing up some wicked sangria today. October 23rd: Happy Birthday M.C.! Michael Crichton would have been 74 today so, show off his books! Not a Crichton fan? What sci-fi read do you recommend? Who are the best (or worst) literary villains? Bonus points if like all Disney villains you call every a “fool” today. Floating candles? Butterbeer or pumpkin juice? Nearly headless ghosts? Give us your best HP Halloween vibes. We’re looking for ghosts, monsters, spine-tingling reads today. We can all agree this is a Halloween classic, right? So much so that Appraising Pages did a special Bookish Box this month. Show off your goodies, or pick a book a Sanderson sister might read. Thank you, oh great arbitrary holidaymakers, for blessing us with this day. Pair your favorite chocolate item with your current read or chocolate-inspired book. characters, show off your favorite! Woohoo! It’s here! Let’s see books and pumpkins!